Resident Evil Revelations HD was set up to look like an episodic game with recaps and mini-credits in between chapters if I remember correctly, but its sequel, Resident Evil Revelations 2 will actually be an episodic game. Similar to Telltale's structure of releases, Resident Evil Revelations 2 will be made available in four chapters, and each will be priced at $5.99. Gamers can also snag up a Season Pass for $24.99, meaning you'll have to pay an extra dollar on top if you get it that way. Is my math correct? Each episode will have "hours" of gameplay, and each will end in a dramatic cliffhanger to keep you waiting until the next is available. Unlike Telltale, though, you won't have to impatiently wait a month or three for the next chapter. Capcom has confirmed that all four chapters will be released weekly in the first month. Those who want a physical disc with extra content can pick one up for $39.99 when the entire episodic run is finished. Both the Season Pass and retail version grant access to bonus material, probably pointing to the destination of that extra dollar. Resident Evil 2 fan-favorite Claire Redfield returns for this adventure, and she brings along with her Moira Burton as both join the anti-bioterror organisation Terra Save. Oh, the Engrish is gorgeous! Sounds like an interesting path for Resident Evil to take considering how well it worked for The Walking Dead. At least Capcom is providing a physical retail option for those who still like to traditionally buy games at the store. The budget for this Resident Evil Revelations 2 is no doubt dwarfed by what Capcom has in mind for Resident Evil 7, so this episodic route might have been the only option it could have taken to justify the game. Just remember though, a limited budget didn't stop Resident Evil Revelations HD from being the best game in the series since Resident Evil 4. 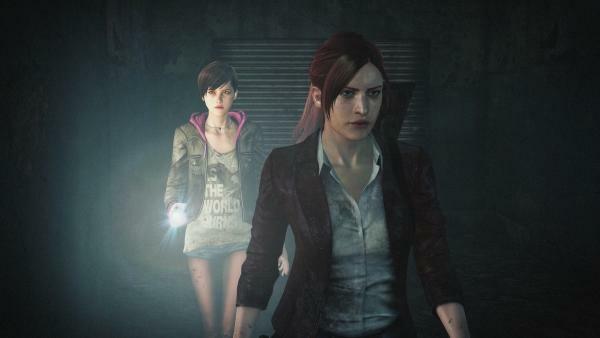 Resident Evil Revelations 2 will be available at the Sony section of Tokyo Game Show 2014. It's pretty high on my list, so be sure to check in on September 18th and 19th for my early impressions live from the floor.